In the wild, the fascinating, native Reed Bees (Exoneura) live in hollow pithy stems of native plants. However, these bees have discovered that old stands of the weed, Lantana, can make wonderful nest sites. Reed Bees are small slender native bees, about 8 mm long. They are found in all states and territories of Australia. Reed Bees may excavate 2 mm wide nest burrows in the pithy centres of thick dead Lantana canes near bushland. Many species have a primitive social behaviour, with a number of bees living in each nest. They individually feed their developing young in the nest with nectar and pollen. 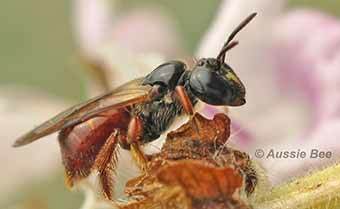 One bee will guard the nest entrance by blocking it with her red or black abdomen (hind segment). This looks like a tiny red or black spot, just inside the opening of the hollow in the cane. So if you are removing mature stands of Lantana with thick dead canes (especially canes which have been cut back in earlier pruning operations), take a close look! If you see the characteristic red or black spots of the Reed Bee abdomens, you have found some colonies of these fascinating bees! 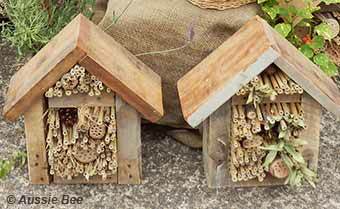 Reed Bee nests can be saved quite easily and moved into your garden, before Lantana is removed. Simply cut out the sections of cane (about 30 to 40 cm long) that contain the nests. Do this in the evening after the bees have finished foraging for the day. Cover the entrance holes with Blu-tak or damp tissue and masking tape, then take them home to your garden. A bundle of cut Lantana canes wired into a shrub. 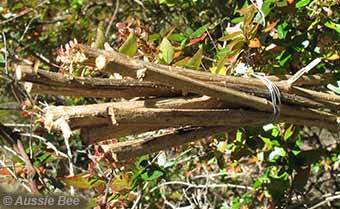 Firmly attach the canes in groups in a suitable shrub in your garden using waterproof tape, wire or plant ties. Try to match the height and angle of the original nests if possible. Unplug the entrances and you will have saved some colonies of Australian native bees! Note: Exoneura Reed Bees can give a small sting; so please handle them carefully.